Background: Valeriana fauriei has been used to treat anxiety and cardiovascular disease in many countries; however, the mechanisms of the vasorelaxant effect of V. fauriei roots and rhizomes have not been elucidated. Purpose of the Study: Considering the increased use of traditional medicines for treating hypertension, the aim of this study was to examine the vasorelaxant effect and investigate the mechanisms of V. fauriei root and rhizome. Materials and Methods: Using an isolated organ-chamber technique, the vasorelaxant effects of 70% ethanol extract of V. fauriei root and rhizome (VFE) were tested in rat aortic ring segments. 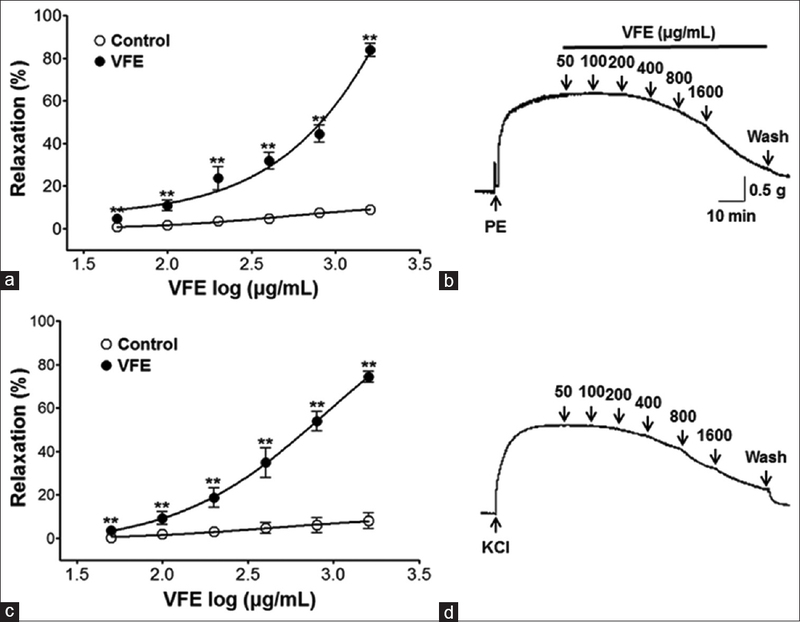 Results: VFE concentration dependently relaxed both endothelium-intact and endothelium-denuded aortic rings that were precontracted by phenylephrine (PE) or potassium chloride (KCl). VFE relaxed the aortic rings precontracted by PE (1 μM) irrespective of K+ channel blocker pretreatment such as tetraethylammonium, glibenclamide, or 4-aminopyridine. VFE inhibited vasoconstriction caused by extracellular Ca2+ influx through receptor-operative Ca2+ channels (ROCCs) or voltage-dependent Ca2+ channels (VDCCs) activated by PE or KCl, respectively, in Ca2+-free Krebs–Henseleit buffer. Conclusion: These results suggested that the vasorelaxant effects of VFE were endothelium independent and not related to K+ channels, such as Ca2+-activated K+ channels, ATP-sensitive K+ channels, and Voltage-gated K+ channels. In addition, VFE relaxed the aortic rings by blocking the influx of extracellular Ca2+ through ROCCs and VDCCs. Abbreviations used: ACE: Angiotensin-converting enzyme; VFE: The 70% EtOH extract of Valeriana fauriei root and rhizome; KH: Krebs–Henseleit; PE: Phenylephrine; KCl: Potassium chloride; TEA: Tetraethylammonium; 4-AP: 4-Aminopyridine; CaCl2: Calcium chloride; EGTA: Ethylene glycol-bis (2-aminoethylether)-N, N, N′, N′-tetraacetic acid; DMSO: Dimethyl sulfoxide; ROCCs: Receptor-operative Ca2+ channels; VDCCs: Voltage-dependent Ca2+ channels; KIR: Inward-rectifier K+ channels; KATP: ATP-sensitive K+ channels; KV: Voltage-gated K+ channels; KCa: Ca2+-activated K+ channels. VFE relaxed the aortic rings by blocking the entry of extracellular Ca2+ through receptor-operative Ca2+ channels and voltage-dependent Ca2+ channels. Hypertension, or high blood pressure, is a major risk factor for the global burden of disease. Blood pressure is related to the amount of blood in the heart and the resistance of the arteries. More blood in the heart and narrower arteries cause higher blood pressure. Even if hypertension progresses without any other symptoms for years, damage to the blood vessels and heart increases over time and serious cardiovascular disorders, such as heart attacks (coronary heart disease) and strokes (cerebrovascular disease), can occur. Hypertension is defined as a systolic blood pressure (SBP) higher than 140 or diastolic blood pressure (DBP) higher than 90 mmHg, whereas prehypertension is defined as an untreated SBP of 120–139 mmHg or untreated DBP of 80–89 mmHg. The one-third of adults in the US (approximately 75 million) affected by hypertension, 11.5 million are not aware of their hypertension, and 18 million are not being treated. Drugs such as angiotensin (AT)-converting enzyme inhibitors, AT-1 receptor antagonists, beta-blockers, calcium antagonists, and diuretics are used as monotherapy for the treatment of hypertension. In addition, combination treatment with these drugs can significantly improve the overall response. However, a recent clinical study indicated that 19.01% of hypertensive patients receiving treatment at a hypertension clinic experienced side effects, including dizziness (56.8%), cough (44.6%), edema (28.4%), and rash/itch (17.7%). Although synthetic drugs are available to treat hypertension, these drugs cause a variety of side effects. Currently, the use of herbal medicine is increasing because of its safety, efficacy, lower incidence of side effects, and increased cultural acceptability. Herbs have long been an integral part of human society. Herbal medicines, including reserpine from Rauwolfia serpentina, salicin from Salix alba, ephedrine from Ephedra sinica, and digitoxin from Digitalis purpurea, have made great contributions to the pharmaceutical industry. More than 150 compounds from the genus Valeriana were isolated, including alkaloids, iridoids, and terpenes. Valepotriate compounds, valerenic acid derivatives, and kessane compounds are the main compounds found in Valeriana plants that have exhibited an antidepressant effect., Moreover, the root and rhizome of V. fauriei contain compounds such as kessane, kessanyl acetate, cyclokessyl acetate, maaliol, kanokonyl acetate, patrinoside, kanokoside, caryophyllene oxide, valerianin E, and monovalerianester A.,, Among these compounds, kessglycol diacetate, kessglycol, and 8-monoacetate are responsible for the sedative effect. V. fauriei has been commonly used to treat anxiety and cardiovascular disease in many countries. Although the vasodilatory effect of 70% methanol (MeOH) extract of V. fauriei root was previously reported, additional or follow-up studies on various mechanisms of the vasorelaxant effect of V. fauriei root and rhizome have not been reported yet. Moreover, due to the high toxicity of MeOH relative to ethanol (EtOH) as the extraction solvent of natural products or herbal medicines, we tested V. fauriei extracts with EtOH instead of MeOH. Therefore, the aim of this study was to examine the vasorelaxant effect and investigate the various mechanisms of 70% EtOH extract of V. fauriei root and rhizome. NucleoSpin Plant II kit (MACHERRY-NAGEL, GmbH and Co. KG, Germany), Blend Taq (pfu) (Toyobo, Japan), Midori green direct (Nippon genetics, Japan), NucleoSpin Gel and PCR Clean-up (MACHERRY-NAGEL, GmbH and Co. KG, Germany) were used for DNA extraction. For the trnH-psbA spacer region a PCR was performed using primers trnHf (5′-CGCGCATGGTGGATTCAC AATCC-3′) and psbA3f (5′-GTTATGCATGAACGT AATGCTC-3′). For the rpoC1 spacer region a PCR was performed using primers rpoC1_2f (5′-GGCAAAGAGGGAAGATTTCG-3′) and rpoC1_4r (5′CCATAAGCATATCTTGAGTTGG-3′). Krebs–Henseleit (KH) buffer powder, phenylephrine (PE), potassium chloride (KCl), tetraethylammonium (TEA), glibenclamide, 4-aminopyridine (4-AP), calcium chloride (CaCl2), ethylene glycol-bis (2-aminoethylether)-N, N, N′, N′-tetraacetic acid, and dimethyl sulfoxide were purchased from Sigma-Aldrich (St. Louis, USA). All other reagents were of analytical purity. Rotary vacuum evaporator (NN series, Eyela Co., Japan) and Freeze-dryer (Operon™, Seoul, Korea) were used for the extraction of plant samples. TissueLyser II (Qiazen GmbH, Germany), T100 Thermal cycler (Bio-Rad, USA), and Gel Doc EZ imager (Bio-Rad, USA) were used for DNA sequencing. Isometric force transducer (Grass instrument Co., Rhode Island, USA) and PowerLab data acquisition system (ADI Instrument Co., New South Wales, Australia) were used to measure the tension developed by the contracting/relaxing vessel. V. fauriei, lying 37°14'N latitudes and 128°90'E longitudes, was collected in Manhangjae, Jeongseon County, Gangwon Province, Republic of Korea, in May 2016. Professor Kyungjin Lee of Kyung Hee University identified the plant. The whole-plant voucher specimen (VS16061618) was deposited in the herbarium of the College of Korean Medicine, Kyung Hee University, Seoul, Republic of Korea [Figure 1]. Dried root (100.0 g) of V. fauriei was extracted once with 1 L of 70% EtOH for 3 h in a reflux apparatus at 70°C ± 5°C. After filtration, the filtrate was evaporated to dryness using a rotary vacuum evaporator (NN series, Eyela, Japan) at 60°C and lyophilized in a freeze-dryer (Operon™, Seoul, Korea) to obtain a dark brown powder (19.2 g) of crude extract. The 70% EtOH extract of V. fauriei (VFE) powder (0.1 g) was accurately weighed into 1 mL KH buffer and placed in an ultrasonic bath for 10 min. The powder was completely dissolved, and the color was dark brown. The dried leaf tissues of V. fauriei were ground into fine powder through the Qiagen TissueLyser II. DNA extraction was constructed using the NucleoSpin Plant II kit. The primers, trnH-psbA and rpoC1, were used for getting sequence of V. fauriei. The PCR reaction mixture contained 20 ng/μL of DNA template and 10 pmole/μL of primer, 5 μL 2 mM-dNTP, 5 μL × 10 buffer, and 0.5 μL of Blend Taq (pfu). For reactions, PCR conditions were as follows: predenaturation at 94°C for 3 min, 94°C 30 s; 34 cycles of denaturation, annealing, and extension were repeated at 94°C for 30 s, at 55°C for 30 s, and at 72°C for 1 min and final extension at 72°C for 5 min per 1 kb. 1 μL of PCR products, 3 μL of 100 bp ladder, and 0.5 μL of Midori Green Direct were loaded onto 1.5% agarose gel for electrophoresis (135V, 25 min). DNA band of PCR products was detected under UV light. The amplified DNA band was purified with the PCR Clean-up kit and DNA sequence was analyzed at Macrogen Inc., Korea. Male Sprague-Dawley rats, 8 weeks of age, weighing 240–290 g were provided by Raon Bio, Gyeonggi Province, Korea. All animal procedures were conducted according to the approval from KHUASP(SE)-16-129 by the Kyung Hee University Institutional Animal Care and Use Committee. The animals were housed under standard laboratory conditions (22°C ± 2°C; lighting, 07:00–19:00) with free access to food and water. Rats were anesthetized by ethyl ether; the thoracic aorta was removed and placed in KH buffer (composition [mM]: NaCl, 118.0; KCl, 4.7; MgSO4, 1.2; KH2 PO4, 1.2; CaCl2, 2.5; NaHCO3, 25.0; and glucose, 11.1; pH 7.4), and continuously aerated with a gas mixture of 95% O2 and 5% CO2 at 37°C. The protocol used in this study has been previously described. Where A is the maximal contraction of aortic rings after precontraction by PE or KCl; B is the contraction of aortic rings with drug treatment; C is the contraction of aortic rings before precontraction by PE or KCl. We tested the concentration-dependent vasorelaxant effects of VFE (50–1600 μg/mL) on endothelium-intact aortic rings precontracted with PE (1 μM) or KCl (60 mM) in standard KH buffer. Compared to the control group (without VFE), the vasorelaxant effect of VFE was calculated as a percentage of the relaxation in response to PE or KCl. We tested the concentration-dependent vasorelaxant effect of VFE (50–1600 μg/mL) on endothelium-intact and endothelium-denuded aortic rings precontracted with PE (1 μM) or KCl (60 mM) in standard KH buffer. The vasorelaxant effect of VFE was calculated as a percentage of the relaxation in response to PE or KCl. We investigated the vasorelaxant effect of VFE (50–1600 μg/mL) in endothelium-intact aortic rings, that were preincubated with various K+ channel blocker, TEA (5 mM), glibenclamide (10 μM), or 4-AP (1 mM) for 20 min before the addition of PE (1 μM). The vasorelaxant effect of VFE was calculated as a percentage of the relaxation in response to K+ channel blockers pretreatment on the aortic rings. We investigated the vasorelaxant effect of VFE (200–800 μg/mL) on extracellular Ca2+-induced contractions through receptor-operative Ca2+ channels (ROCCs) or voltage-dependent Ca2+ channels (VDCCs) by PE or KCl pretreatment, respectively. We tested the contraction response induced by CaCl2 (0.3–10 mM) in the endothelium-denuded aortic rings precontracted by PE (1 μM) or KCl (60 mM) in Ca2+-free KH solution after preincubation for 10 min with and without (control) VFE. When compared to the control group, the contraction responses induced by CaCl2 were calculated in the presence and absence (control) of VFE. All results were expressed as mean ± standard error of mean. Statistical comparisons were made using Student's t-test. All statistical analyzes were performed using IBM SPSS version 23.0 (SPSS Inc., Chicago, IL, USA). P < 0.05 was considered statistically significant. The dried leaf of V. fauriei was amplified by PCR reaction and subjected to DNA sequencing. NCBI nucleotide blast search showed 98% (trnH-psbA) and 99% (rpoC1) sequence identity of V. fauriei (GenBank ID: KJ025054.1) and V. fauriei (GenBank ID: JF269866.1), respectively. VFE caused vasorelaxation on endothelium-intact aortic rings precontracted by PE (1 μM) or KCl (60 mM) treatment. The maximal relaxant effect was 83.9% ± 3.1% and 74.4% ± 2.5% at the concentration of 1600 μg/mL [Figure 2]. VFE caused vasorelaxation on the endothelium-intact or endothelium-denuded aortic rings precontracted by PE (1 μM) or KCl (60 mM). The maximal relaxant effect on PE-induced contraction was 83.9% ± 3.1% and 83.9% ± 2.6% for endothelium-intact and endothelium-denuded aortic rings at the concentration of 1600 μg/mL, respectively [Figure 3]. The maximal relaxant effect on KCl-induced contraction was 74.4% ± 2.5% and 76.6% ± 3.7% for endothelium-intact and endothelium-denuded aortic rings at the concentration of 1600 μg/mL, respectively [Figure 3]. Incubation with K+ channel blockers such as TEA (Ca2+-activated K+ channel [KCa] blocker, 5 mM), glibenclamide (ATP-sensitive K+ channel [KATP] blocker, 10 μM), or 4-AP (voltage-gated K+ channel [KV] blocker, 1 mM) did not affect VFE-induced relaxation on endothelium-intact aortic rings pre-contracted by PE (1 μM) treatment. 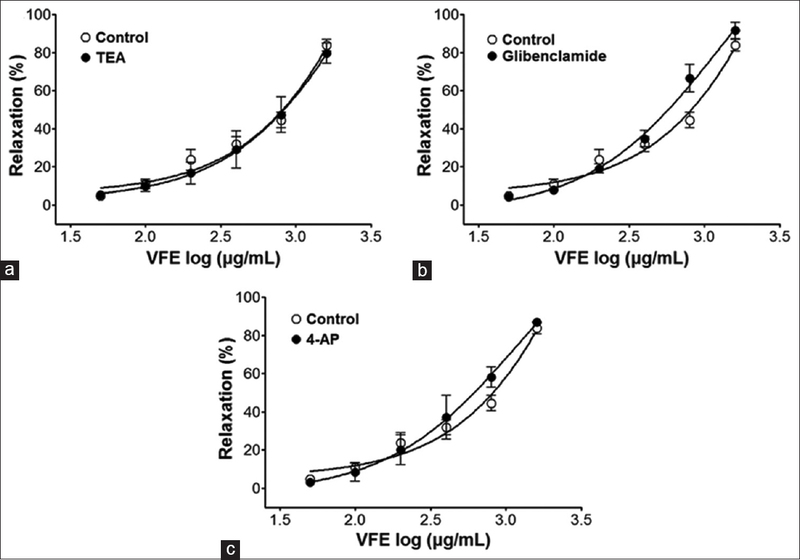 In the presence of TEA, glibenclamide, or 4-AP, the VFE-induced relaxant effect was of 79.7% ± 5.3%, 91.5% ± 4.3%, 86.8% ± 2.2% versus the control group 83.9% ± 3.1% at the concentration of 1600 μg/mL), respectively [Figure 4]. In Ca2+-free KH solution, the cumulative addition of CaCl2 (0.3–10 mM) to the organ baths induced gradually increased tension on the rat thoracic aorta by PE (1 μM) or KCl (60 mM) treatment. Preincubation with VFE (200–800 μg/mL) significantly inhibited the contractions induced by CaCl2 (10 mM). The contraction at VFE (800 μg/mL) treatment was decreased to 0.19 ± 0.17 g and − 0.15 ± 0.04 g versus the control group 1.74 ± 0.08 g and 1.27 ± 0.07 g, on aortic rings precontracted by PE and KCl, respectively [Figure 5]. Previous studies indicated that the root and rhizome of V. fauriei mainly contain iridoid glycosides and kessane sesquiterpenoids and the herb has been used to treat anxiety and convulsions. Previous studies have shown that the maximal vasorelaxant effects of the chloroform (CHCl3) and water layers of the 70% MeOH extract of V. fauriei root were 98.1 ± 0.7 (1 mg/mL) and 96.9 ± 2.6 (10 mg/mL), respectively. The relaxant effects of the CHCl3 layers were more effective than those of the water layers on rat thoracic aortas contracted by 5-HT (100 μM). In the present study, we used 70% EtOH as the extraction solvent instead of MeOH because MeOH can cause metabolic acidosis, neurologic sequela, and even death. VFE concentration dependently caused gradual relaxation of endothelium-intact aortic rings contracted by PE (1 μM) and KCl (60 mM). The maximal relaxant effects were 83.9% ± 3.1% and 74.4 ± 2.5% at concentration of 1600 μg/mL. V. fauriei may be a good natural medicine candidate for the treatment of hypertension. PE is an α1-adrenergic agonist that contracts vascular smooth muscle cells (VSMCs) by extracellular Ca2+ entry through ROCCs and by intracellular Ca2+ release from the sarcoplasmic reticulum though IP3R pathway, whereas high concentration KCl contracts VSMCs by extracellular Ca2+ influx though VDCCs after depolarization of the cell membrane. Therefore, PE and KCl were used as vasoconstrictors to investigate the vasorelaxation of VFE. Normal endothelial cells, which exist in the vascular walls of the smooth muscle cells, are important regulators of vascular homeostasis. Moreover, they are related to changes in blood composition and blood flow. Endothelial dysfunction causes several pathological conditions, including atherosclerosis, owing to coagulation, inflammation, and vasoconstriction. It is well known that vascular endothelial cell plays an important role in regulating the function of cardiovascular system by secretion of vasodilator such as endothelium-derived relaxing factor (NO), prostacyclin, and endothelium-derived hyperpolarizing factor (EDHF) and vasoconstrictors including endothelin. In this study, VFE concentration dependently relaxed both endothelium-intact and endothelium-denuded aortic rings that were precontracted by PE or KCl. This result indicated that the activity of VFE was not related to endothelial function. K+ channels are the main regulators of vascular tone and diameter and activation of K+ channels can lower blood pressure through vasodilation. Conversely, deactivation of K+ channels can raise blood pressure through vasoconstriction of VSMCs. Four types of K+ channels have been identified, including nonselective KCa, KATP, KV, and inward rectifier K+ channels. Along with argument that the efflux of K+ from the potassium channels in the endothelium cell is partly related to a part of EDHF causing vasorelaxation, large conductance KCa channels, KATP channels, and KV channels are especially abundant in VSMCs. In this study, endothelium-intact aortic rings without unintended wounds by removing the endothelium on the VSMCs were used to evaluate the involvement of various potassium channels and VFE-induced vasorelaxation effects. We tested various K+ channel blockers, including TEA (KCa channel blocker), glibenclamide (KATP channel blocker), and 4-AP (KV channel blocker). VFE relaxed the aortic rings that were precontracted by PE (1 μM), irrespective of K+ channel blockers pretreatment. Therefore, VFE-induced relaxation was not related to K+ channels such as KCa channels, KATP channels, and KV channels. Ca2+ is a major factor involved excitation-contraction coupling that initiates contraction of smooth muscle. Considering the influx of extracellular calcium ion into the cytosol, there are typically three types of calcium channels such as ROCCs, L-type VDCCs, and store-operated calcium channels (SOCCs). The mechanism of vascular smooth muscle contraction and relaxation involves various signal transduction pathways, which are mainly regulated by the influx of extracellular Ca2+ through ROCCs or VDCCs. In the present study, we denuded the endothelium to achieve more precise VFE-caused blocking results at the entry of extracellular Ca2+ through ROCCs or VDCCs in VSMCs, even though VFE-induced vasorelaxation effects were endothelium independent. VFE concentration dependently inhibited vasoconstriction caused by extracellular Ca2+ influx through ROCCs or VDCCs activated by PE or KCl, respectively, in Ca2+-free KH buffer. More than 150 compounds from the genus Valeriana were isolated. V. fauriei contains a variety of compounds, including kessane, kessanyl acetate, patrinoside, kanokoside, caryophyllene oxide, and valerianin E. However, more pharmacological studies are needed regarding the vasorelaxation mechanism of these compounds. Therefore, further research should be carried out to determine the mechanism of action of the diverse compounds from this plant on rat aortic rings. We concluded that the vasorelaxant effects of VFE were endothelium independent and (2) not related to K+ channels, such as KCa, KATP, and KV channels, and (3) VFE relaxed the aortic rings by blocking the entry of extracellular Ca2+ through ROCCs and VDCCs. This research was supported by a grant (15172MFDS184) from the Ministry of Food and Drug Safety in the study on improvement for quality standards of the official document on herbal medicine (2015–2017). Announcement: National high blood pressure education month-May 2016. MMWR Morb Mortal Wkly Rep 2016;65:523. Groha P, Schunkert H. Management of arterial hypertension. Herz 2015;40:929-40. Meena J, Raghav P, Rustagi N. LBOS 03-06 anti hypertensive treatment compliance and adverse effect profile among hypertension clinic attendees in Jodhpur, India. J Hypertens 2016;34:e552. Razavi BM, Hosseinzadeh H. Saffron: A promising natural medicine in the treatment of metabolic syndrome. J Sci Food Agric 2017;97:1679-85. Rastogi S, Pandey MM, Rawat AK. Traditional herbs: A remedy for cardiovascular disorders. Phytomedicine 2016;23:1082-9. Bonchohak. National Editorial Board of Korean Medicine for Textbook. Seoul: Younglimsa; 2011. p. 496-7. Park YJ, Arasu MV, Al-Dhabi NA, Lim SS, Kim YB, Lee SW, et al. Expression of terpenoid biosynthetic genes and accumulation of chemical constituents in Valeriana fauriei. Molecules 2016;21. pii: E691. Liu XG, Gao PY, Wang GS, Song SJ, Li LZ, Li X, et al. In vivo antidepressant activity of sesquiterpenes from the roots of Valeriana fauriei briq. Fitoterapia 2012;83:599-603. Oshima Y, Matsuoka S, Ohizumi Y. Antidepressant principles of Valeriana fauriei roots. Chem Pharm Bull (Tokyo) 1995;43:169-70. Kim JS, Ahn JD, Cho SI. Effects of valerianae radix et rhizoma extract on psychological stress in mice. Pharmacogn Mag 2015;11:381-8. Lee H, Won H, Im J, Kim YO, Lee S, Cho IH, et al. Effect of Valeriana fauriei extract on the offspring of adult rats exposed to prenatal stress. Int J Mol Med 2016;38:251-8. Guo Y, Xu J, Li Y, Yamakuni T, Ohizumi Y. Three-membered ring sesquiterpenoids with NGF-potentiating activity from the roots of Valeriana fauriei. Planta Med 2006;72:373-5. Guo Y, Xu J, Li Y, Watanabe R, Oshima Y, Yamakuni T, et al. Iridoids and sesquiterpenoids with NGF-potentiating activity from the rhizomes and roots of Valeriana fauriei. Chem Pharm Bull (Tokyo) 2006;54:123-5. Kim SK, Kim KS, Kim YH, Lee UC, Ahn DJ, Kim YH. 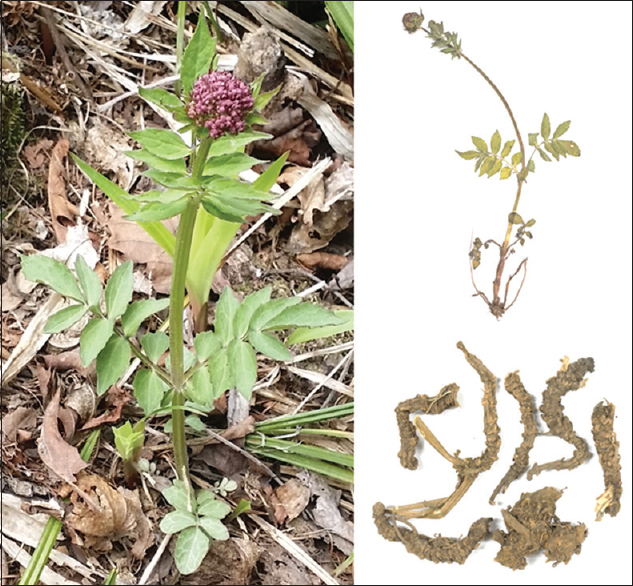 Isolation and identification of biologically active components from Korean Valerian roots. J Korean Soc Tob Sci 2003;25:80-6. Park YJ, Li X, Noh SJ, Kim JK, Lim SS, Park NI, et al. Transcriptome and metabolome analysis in shoot and root of Valeriana fauriei. BMC Genomics 2016;17:303. Nishiya K, Kimura T, Takeya K, Itokawa H. Sesquiterpenoids and iridoid glycosides from Valeriana fauriei. Phytochemistry 1992;31:3511-4. Zhang ZX, Dou DQ, Liu K, Yao XS. Studies on the chemical constituents of Valeriana fauriei briq. J Asian Nat Prod Res 2006;8:397-400. Yuki K, Ikeda M, Yoshida S, Ohno O, Suenaga K, Yamada K, et al. Isolation of monovalerianester A, an inhibitor of fat accumulation, from Valeriana faurie i. Nat Prod Commun 2015;10:1333-4. Hur M, An TJ, Oh DJ, Ahn YS, Park CB. Status of research and usage of Valeriana fauriei briquet. Korean J Med Crop Sci 2011;2011:188-9. Kim SK. Experimental Studies on the Sedation, Hypnosis and Vasodilation Effects of Domestic V. fauriei. Seoul, Korea: Graduate School of Kyung Hee University; 2005. Kim B, Lee K, Chinannai KS, Ham I, Bu Y, Kim H, et al. Endothelium-independent vasorelaxant effect of ligusticum jeholense root and rhizoma on rat thoracic aorta. Molecules 2015;20:10721-33. Thorneloe KS, Nelson MT. Ion channels in smooth muscle: Regulators of intracellular calcium and contractility. Can J Physiol Pharmacol 2005;83:215-42. Nelson MT, Quayle JM. Physiological roles and properties of potassium channels in arterial smooth muscle. Am J Physiol 1995;268:C799-822. Michiels C. Endothelial cell functions. J Cell Physiol 2003;196:430-43. Vanhoutte PM. Endothelium and control of vascular function. State of the art lecture. Hypertension 1989;13:658-67. Luksha L, Agewall S, Kublickiene K. Endothelium-derived hyperpolarizing factor in vascular physiology and cardiovascular disease. Atherosclerosis 2009;202:330-44. Sobey CG. Potassium channel function in vascular disease. Arterioscler Thromb Vasc Biol 2001;21:28-38. McFadzean I, Gibson A. The developing relationship between receptor-operated and store-operated calcium channels in smooth muscle. Br J Pharmacol 2002;135:1-3. Xu WQ, Xiong ZZ, Chen TT, Gao XY, Yu H, Zhang SQ, et al. Vasodilation effect of 2-benzyl-5-hydroxy-6-methoxy-3, 4-dihydroisoquinolin-1-one. Arch Pharm Res 2012;35:1471-7.